It ruined mothers (and fathers) and was an early harbinger of binge-drinking Britain: Gin. It also has been described as “the magic that happens when you combine a base spirit with unique combinations of aromatic botanicals.” Magic may also be finding the Plymouth distillery without a map when you don’t know your way around the city. Running late, circumnavigating the old city in search of parking, Roger and I catch a quick glimpse of the historic quarter of Plymouth as we dash around the corner to find ourselves standing before the whitewashed Blackfriars Distillery. We arrived somewhat late for our tour. Shaken, but not stirred. Our tour began with a history of The Black Friars Distillery in Plymouth. This is one of the oldest working distilleries in England and has been making this famous hooch since 1783. The building dates back to the 1400s, once serving as a monastery inhabited by the Black Friars and is allegedly haunted. I hear this and think — don’t be silly, of course there are spirits inside. We quickly discover there is a good deal more than that at this distillery. There is a fabulous lounge bar, The Refectory, which is apparently where the Pilgrim Fathers gathered before they set sail on the Mayflower for America in 1620. I wonder: would they have imbibed some of this local tipple? Gin may have once been seen as the choice of grannies, but according to our guide, we are entering the biggest gin craze since the days of William Hogarth! In the early days of gin, it was a relatively cheap alcoholic beverage, easily produced at home. It was purchased and consumed in ruinous amounts by the poor, contributing to any number of social problems. Then came the British Royal Navy who both consumed and introduced gin, specifically Plymouth Gin, throughout the world. In India, gin was mixed with the tonic water consumed for the anti-malarial properties of quinine, thus leading to one of my favourites: the Gin and Tonic. Plymouth Gin is also the only UK gin to have a Protected Geographic Status, sharing place with Scotch Whisky, West Country Farmhouse Cheddar, and, The Cornish Pasty to name a few. This status resulted from legal decisions in the late 1800’s when London distillers began producing a Plymouth gin. The then owners legally established Plymouth Gin could only be made within Plymouth’s city walls. 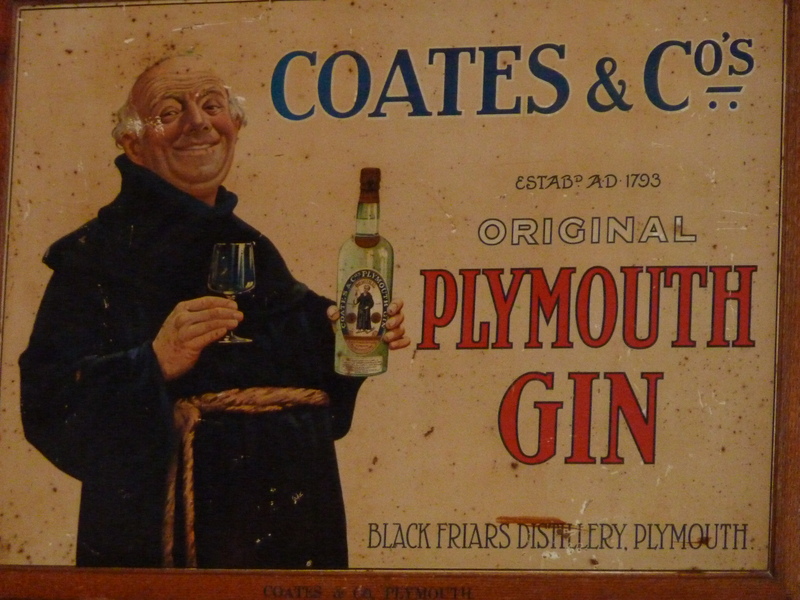 Still today, Plymouth Gin can only be produced in the old part of Plymouth in Devon. With our history lesson over, we moved into the distillation room to understand how gin is made. This is no bathtub-in-the-barn operation. The still, with its elegant swan neck high above our heads, has not been changed for over 150 years and this is largely to do with the local water. That’s right, the pure water from Dartmoor, some of which is running past our house, is softer than a lot of the calcified waters found elsewhere in the UK. As such, it is credited with the unique flavour of Plymouth Gin. My affection for Plymouth Gin was growing exponentially. Full of cultural, geographic and historical information, Roger and I are then taken to sample gins. And of all the gin joints, in all the towns, in all the world we walked into what I would like to dub The Inner Sanctum, an underground Gin Palace of sorts, to begin our tasting tutorial. On the shelves there appeared to be a bottle of what may well be every gin produced anywhere in the globe. We took our perch at the bar. Before us appeared five unlabeled popular gins next to a tray of seven botanicals – juniper, coriander, sweet orange, lemon, cardamom, angelica and orris root. We smelled botanicals, we smelled gins, and we tasted gins. In short, it was a tour de force of flavours! In our blind tasting, we both chose Plymouth Gin. What a relief. It would feel like an act of betrayal to select a competitor. As our tour was nearing the end, we thanked our guide and made our way to The Refectory lounge, complete with plush sofas, a piano, a long curved bar and a long list of classy cocktails on the beverage menu. We nestled into a corner sofa, placed our order and looked above at the spectacular hull-shaped timber roof of the medieval hall. Before leaving, we purchased a bottle. Sitting by the fire, sipping my lovely new gin and writing this blog, I’ve uncovered the Ginstitute, a new gin museum in London. Clearly, this is a must see when I am next in the Big Smoke. For now, I will turn my thoughts to spring and our gardening efforts. Our hardy winter garden is bravely holding up against the recent frosts, down pours of rain, and the forecast for snow this week. Hey bartender…. On the bottle there is an image of one of the monastery’s friars. It was said when the monk’s feet “got dry”; it was time for a new bottle. 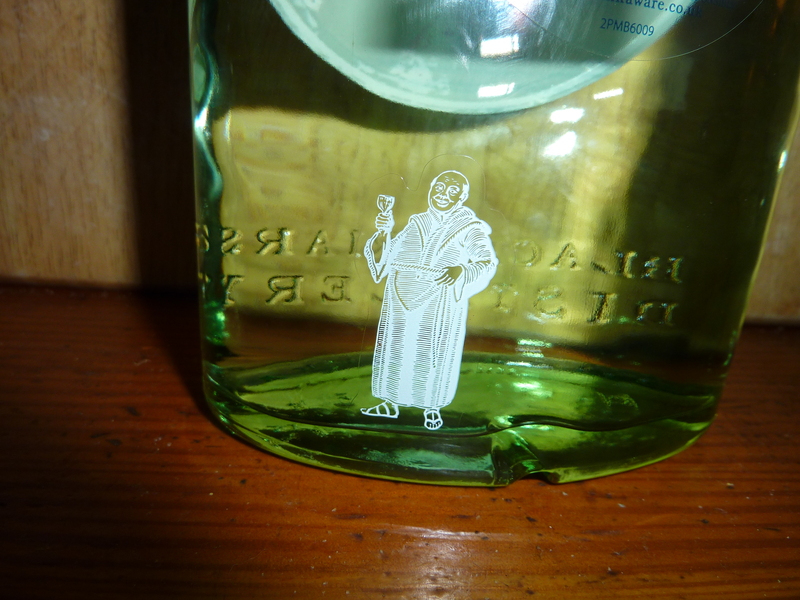 Despite many bottle redesigns, this little monk icon remains on the back. We shall not let his feet grow dry. Looking out the window at the West Dart River these past weeks reveals a river gone mad. During the recent storms, it was consistently a fast moving, boiling, roaring, torrent of water. On more than one occasion it breached its banks, taking part of our stonewall with it and I worried about the big trees on the opposite bank, which became temporary islands of wood as the river swelled with the rains. These trees already have awkward leans to them, making it seem as if it is just a matter of time before they slide into a resting position on the hillside as I would onto the sofa. And yet this same river on a warm day offers a place for wading or taking a cooling dip. The waters gently babble past providing a refreshing tonic. One summer day, we stood in the river drinking beers with our friend Hilary. The cool river water gently washed past our legs as we shared stories and contemplated dinner. Meanwhile, her sons Thomas and Charlie splashed about in the deeper water. It was a wonderful afternoon and we have since claimed this patch of river our local watering hole, dubbing it Down By The River. Same river view. The river here is swollen and there is no land between the river and the wall. Water is something we have in abundance on Dartmoor. 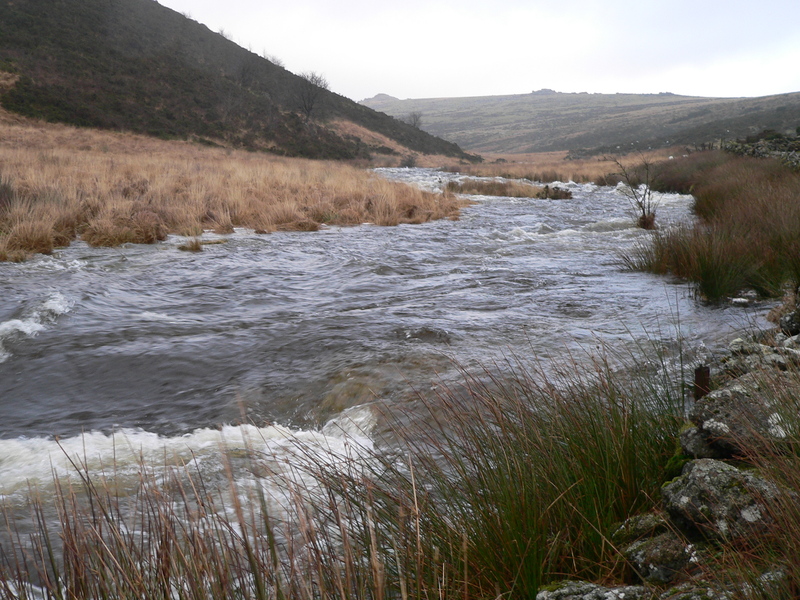 The high ground of Dartmoor forms a catchment area for many of Devon’s rivers. 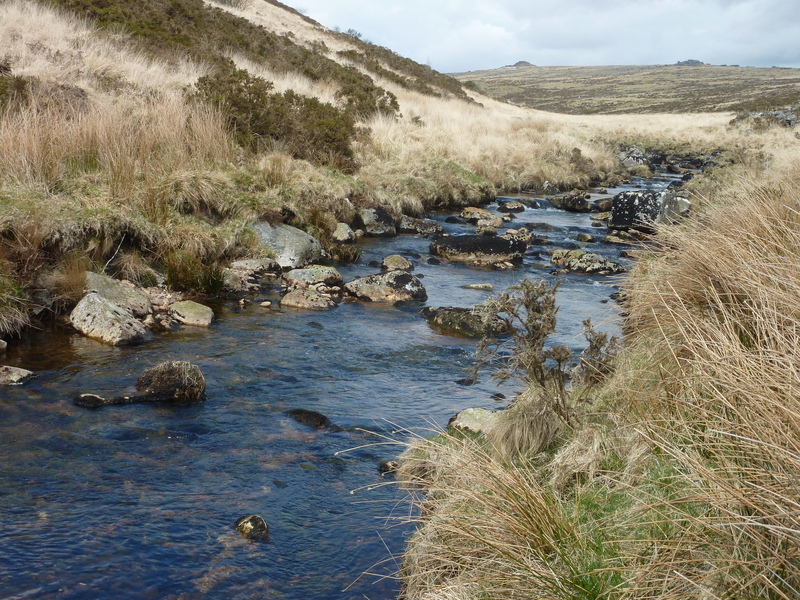 The approximate total length of the 25 rivers on Dartmoor is over 130 miles and this does not include all the miles of leats and streams. Some of these main rivers are steep and fast flowing and respond almost instantaneously to rainfall, growing faster, wider and wilder as ground saturation increases. Just look out of our windows! In the last week of 2013 and into the first week of 2014, we have had a lot of rain. In one 12-hour period of time, up to 40 millimeters of rainfall was reported over Dartmoor. Our river had more than doubled in size. The West Dart becomes a torrent. Fortunately, a brief break in the rain allows the rivers to recede back to normal. The elasticity of these flowing bodies of water is nothing less than spectacular. In addition to my concern for the trees and our stonewall, we recently had to rescue three sheep who had become trapped between the swelling river and the stonewall. They were nervously standing on a morsel of high ground, which was rapidly diminishing as the water rose. Roger and I had no interest in spooking the sheep, nor did we have any intention of getting on the same side of the wall with them. Imagine how easily we could have lost our footing and been taken under by the river. As we plotted what to do, one of the sheep was starting to negotiate her cautious move along the stonewall. The ground here is filled with reeds, holes, rocks and no end of ankle turning challenges. But as she started to make her way north, the other two slowly followed. Just before the river broke its banks, washing away the sheep’s high ground, the three made it to a wider patch of land. They were safe and oblivious to the danger around them so resumed eating grass. We went back inside. Not everyone is so lucky. We have heard numerous stories about people crossing these swollen and rapid moving rivers, only to be dragged under and drown. And yet, that doesn’t stop the brave and adventurous souls who pitch up with their river kayaks and make their way from Two Bridges to Dartmeet where the West and East Dart Rivers meet to become The River Dart. 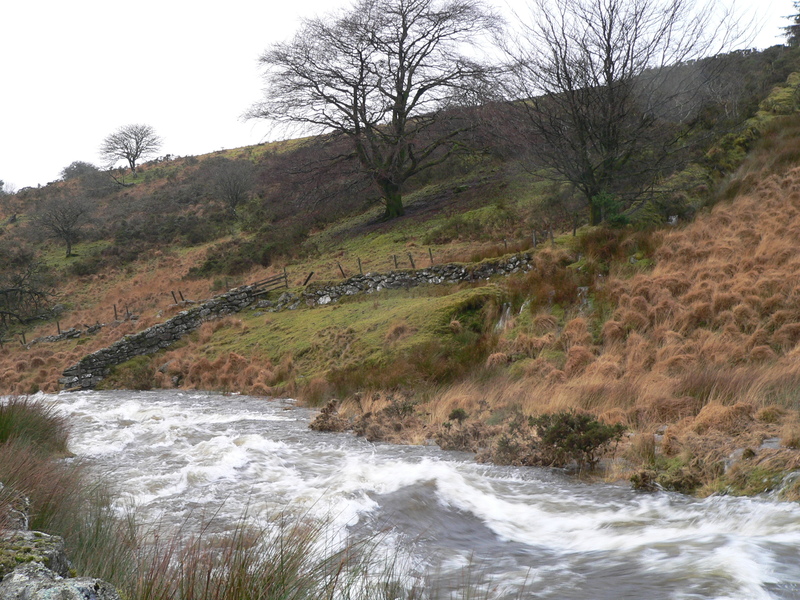 I love these rivers, not just their rapid rise and fall of water level, but that they provide a special habitat for some of Dartmoor’s wildlife. Most of the plants along the banks are grasses, mosses and ferns, but in the summer watching dragonflies flit about is a delight. Anglers routinely wade up the river in hopes of a catch of brown trout. I admire their optimism and confidence, as the only trout we’ve spotted are around 6 inches long! We have yet to spy dipper or kingfishers along our stretch of river, but we have seen many a heron wading along in search of those 6-inch brown trout! What I long to see is the elusive Otter. These endangered wildlife are reported to be making a comeback along Dartmoor Rivers (book recommendation: Otter Country by Miriam Darlington). Since Otters are nocturnal and secretive, seeing one would be magical. 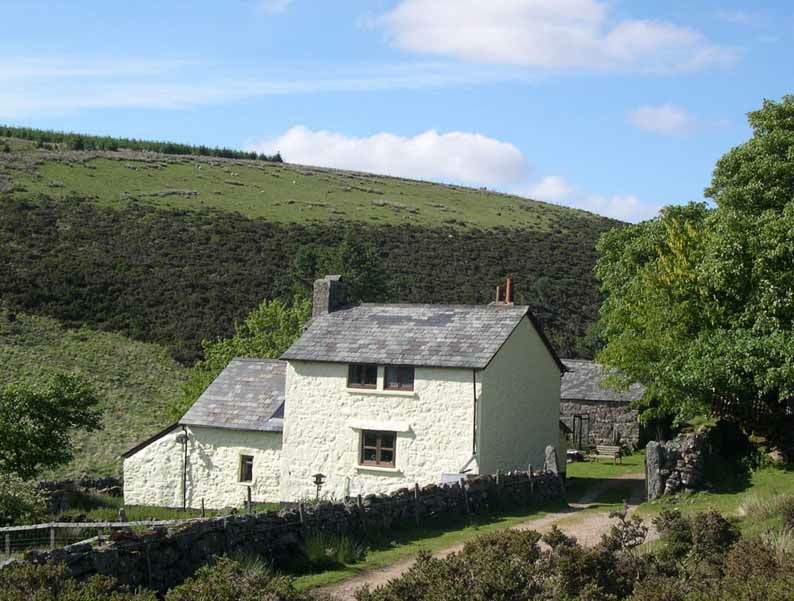 The rivers of Dartmoor helped shape this landscape and once provided a source of power for industries such as tin mining and quarrying. Today, they continue to provide for household uses, drinking water, and leisure activities. And for the past 200 years, one of the uses of Dartmoor water has been in the distillation process of Plymouth Gin. So Take Me To The River, drop me in the water and sign me up for a tour. And that is just what we’ve done. Next week, we are heading to the Plymouth distillery for a Gin Connoisseur’s tour. I. Can’t. Wait. For. This. Tour!